With long-running anime series such as Naruto, One Piece and Gintama, I might as well review them based on arcs. Because, and I'm sure most of you will agree, these types of anime have their high and low points with plenty of fillers. So why not start off with Gintama? Unlike other anime, Gintama doesn't waste time by dragging out arcs, which is what makes it one of the best long-running series in my opinion. Naruto and Bleach have done that by dedicating around 10-20 episodes per arc, but whilst some of them are really good, others I find become boring because not much is going on. This puts me off and I ended up watching Bleach in 5/6 years, and Naruto took probably the same amount of time before I finally reached Naruto Shippuden. I haven't seen One Piece so I have no idea what that's like, but let me know in the comments. Anyway, focusing on Gintama, the arc is based on Yagyu Kyubei. She was brought up as a boy which has ended up confusing her in how she should act now that other people know who she really is. This becomes more obvious when she walks past a mysterious person who claims to be able to fulfil her wish, though how it would affect others is unknown. Although Kyubei rejects the offer, that person causes a large purple ball to fall on the Kabuki District, causing anyone who came in contact with it to change gender. 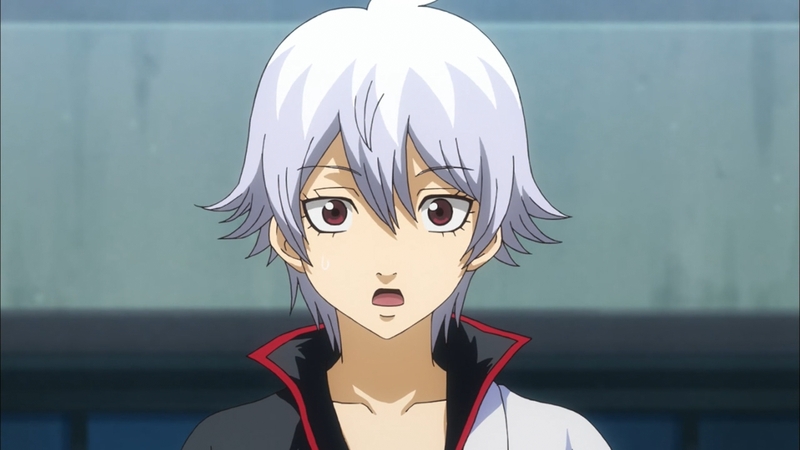 Prepare for lots of comedy when Kyubei (now Jyubei) sees Gintoki (now Ginko) and others who have changed gender. All except Otae and Shinpachi, though his glasses have changed colour. Kagura seems to become this hero-like male whilst Kondo and Sougo have become beautiful women. Mayonnaise-loving Hijikata has also changed, but due to eating lots of mayonnaise, the calories have caught up with him. Poor Hijikata. Sadaharu has also changed, becoming the noble steed of hero Kagura. Now for the serious bit. The mysterious woman tells us that the God Dekobokko has turned everyone who was exposed to the purple ball into their opposite gender as they're not fulfilling the roles of their original gender. But it later comes out that there Dekobokko is a satellite in space, and the purple ball is in fact a virus which the Dekobokkoists tried to make so men were more masculine and women were more feminine but backfired. So now Ginko and co must find a vaccine in order to return themselves and everyone to normal. This is a hilarious arc even when serious. The women-turned-men and Hyakka must now take the limelight and defeat the followers who are trying to stop them. And as Otae puts it, they've put the actual men to shame. Young Kagura doesn't understand what's going on some points, bless her. And as always, Sougo finds a way to insult or get rid of Hijikata, Things turn around when the archbishop sends another ball of the virus down, turning everyone but Ginko and co back to normal. They try to ask for another ball to come down, but there's an announcement that the satellite has been destroyed. So now they must deal with who they are now, which they do except for Ginko who has vanished for some reason. But she comes back and talks to Jyubei about whether this is really what he wants, and tells him that he's not the only one feeling lost about their current state and situation. Fast forward to the planet the Dekobokkoists are targeting, and things don't turn out well for them when Jyubei and co attack them. And they've turned back to normal! Happy days. Gintama always pleases and never lessens the humour it delivers. Get watching guys!